My favorite way to eat peanut butter and jelly sandwiches is on toasted wheat bread, with crunchy peanut butter and lots of chunky strawberry preserves. The warm toast melts the peanut butter just a little so that it drips out of the sandwich, just begging to be licked before you take a bite. The saltiness and sweetness of the sandwich is what makes it so delicious. 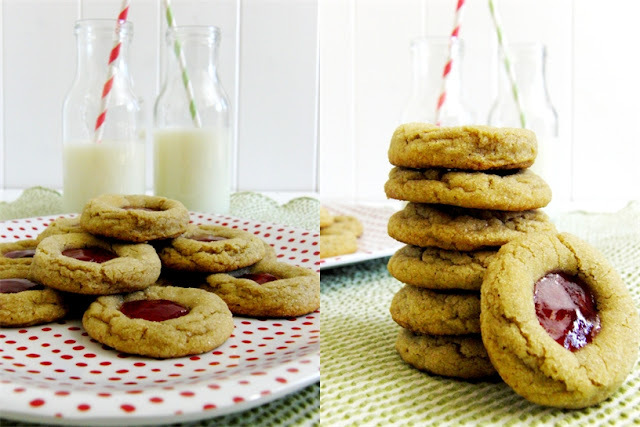 Peanut butter and jelly is one of those all-American combinations that just about everyone loves, and this cookie combines those flavors into a yummy little treat. And doesn't this cookie just look like Christmas? These would be so pretty for a holiday cookie exchange, or a fun treat to make with the kids. I've been making the same peanut butter cookie since I was 20, and I've never even tried another one because I just love this one so much. When I was teaching overseas, I decided one week to make treats for my students, and it had to be these peanut butter cookies - which I usually top with a Hershey's kiss. Most people call those Peanut Butter Blossoms, but I like to call them Peanut Butter Kiss Cookies. Having more than 250 students and a very small oven that could only bake 6 cookies at a time, you can imagine the time and ingredients it took to make enough cookies for them to each get 2. Every night that week, I made a huge batch of batter (without an electric mixer) and spent the evening in my little kitchen baking 6 at a time until I had enough freshly baked cookies for the next day's classes. As well as a few extra for some of the other teachers. This year I'm not making decorated sugar cookies - although I love making them into different shapes and decorating them, I'm just not that big a fan of eating them since they're so overly sweet. Instead, I've been baking some other cookies to satisfy my need to bake for the holidays. 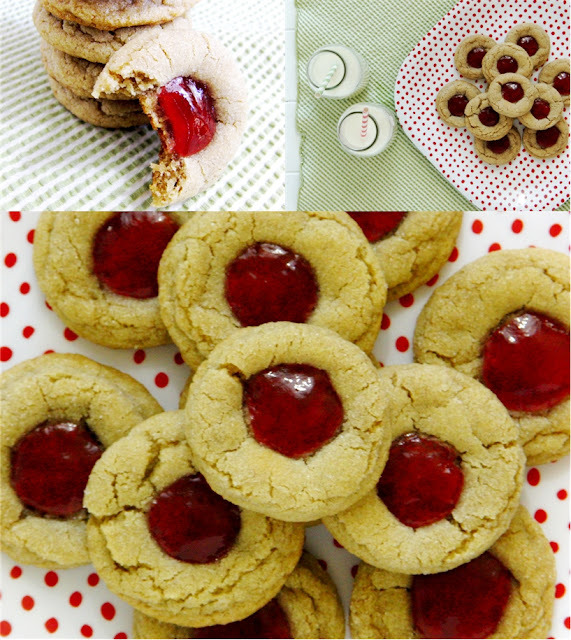 And what could be prettier or yummier than a shiny dollop of jam on a soft peanut butter cookie? These took me a few tries to get just right. First, I pressed an indentation in the cookies and baked them with the jam right from the start - but they spread everywhere and didn't look right at all. I thought it was the pan, so I tried a non-stick pan without parchment or a silpat, and still they spread out very unattractively. I just didn't understand why they were spreading out so much since they never do that when I bake them plain, topping them after the fact with the Hershey's kiss. I baked 3 dozen unsuccessful cookies before I changed course - I've got to learn to start only baking 2 cookies at a time for the trial runs so I don't waste so much batter. After thinking about it for a while, I thought that much colder dough would help them keep their shape - so I rolled the remainder of the dough into balls and froze those for an hour, before baking them straight from the freezer. And this time, instead of pressing the cookies down and filling with jam right away, I baked them first, then finished that step at the very end so that they had a change to get nice and puffy before adding the jam. Is it presumptuous to say they were perfect? The cookies were so soft and moist, held their shape beautifully, and the jam set up just right. The rave reviews the cookies received at book club the next day confirmed just how good they were. I've seen so many peanut butter cookie recipes that tell you to bake the cookies for 15-20 minutes - are they crazy? These are baked for no more than 9 minutes, for soft, gooey, cookie goodness. Is there anyone who doesn't love a peanut butter cookie? If there is, I think they must be from another planet... And even at that, I'd be surprised if aliens don't love peanut butter cookies, too. They would sure love these. With your electric mixer beat the butter and both sugars (reserving the 1/4 cup white sugar for later) on medium speed for 5 minutes, scraping the bowl occasionally, until light and fluffy. Add the peanut butter and beat until smooth. Add the egg and vanilla and beat until well combined. In a separate bowl, combine the flour, baking soda and salt. Reduce the mixer speed to low and add the flour mixture in 3 additions, alternating with the milk. Mix just until combined. Place the dough in the refrigerator to chill for 1 hour until firm enough to roll into balls. Roll rounded tablespoons of cookie dough into balls, then roll the balls in the remaining 1/4 cup sugar. Place on a cookie sheet (you can put them close together to fit them all on one sheet for this step). Freeze dough balls for 1 hour. Preheat the oven to 375 F. Working in batches, place the frozen cookie balls 2 inches apart on an ungreased baking sheet (don't use parchment or a silpat, or they may spread too much, and you want them to stay small, round and puffed). Keep the remainder of the cookie balls in the freezer until you're ready to bake them. Bake the cookies for 7 minutes. Remove from the oven and, working quickly, press an indentation in the center of each cookie using the back of a teaspoon measuring spoon. Fill the indentations with the jam (To be able to do this as quickly as possible, I first warmed the jam in the microwave for 30 seconds, stirred until smooth, then spooned the jam into a small squeeze bottle to quickly and easily fill the cookies.) Return the cookies to the oven and bake for an additional 2 minutes. Cool the cookies on the pan for 1 minute, then transfer to a wire rack to cool completely. They may appear to be too soft and unbaked, but trust me, they'll set up as they cool, and the following day they'll be so soft and yummy that you may just want to cry out of happiness! Notes: The dough can also be prepared and refrigerated for several weeks ahead of time. Baking the jam in the last two minutes sets the jam a little so that it won't be too messy later, and you should be able to stack the cookies to store them in an airtight container without messing up the jam. Instead of jam, try a little Nutella. Or, for one of my favorite cookies, press a Hershey's kiss into the center of the cookie after it's baked.